A Conspiracy Thriller. The Truth About Human History Is About To Be Revealed. But Will We Be Allowed To Know The Truth? For thousands of years the truth about human history has intentionally been suppressed and exploited. For decades scholars have been saying that the truth about human history will be found inside the Great Pyramid of Giza, but up till now no one has ever been able to find it. Those who tried have been ridiculed and persecuted. Will Daniel Rossler and Dr. Sarah Clarke be allowed to uncover the real and true message? As they come closer to the truth, skepticism out of the academic community is replaced by evil and malicious adversaries, dumping them into a very hostile world where violence, deceit, and duplicity become their daily companions. The mysterious Orion Society with its deranged and psychopathic members, the CIA, the Marines, the Mossad and even the President of the United States become involved. Not all of them have good intentions. 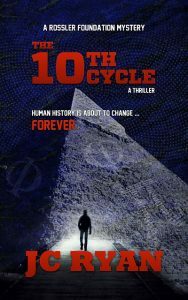 THE TENTH CYCLE is a full-length novel, a provocative technothriller about human history, conspiracies and an ancient society with power and money that will stop at nothing to reach their sinister goals. This fast-paced thriller adventure is the first book in J C Ryan’s Rossler Foundation Mystery Series. “The victor gets to write the history.” In other words, there is almost always another side, an untold side, to historical events. Not only is knowledge lost over time, it also gets twisted over time. In the scientific community of archeology ‘conformity’ has become a password. Nothing will be accepted unless it conforms to the current way of thinking. If anything ‘un-conforming’ is discovered it is either ignored or twisted until it fits into the mold. Watching a TV show on the history channel speculating that the Great Pyramids could not have been built the way modern day Egyptologist want to make us believe, led me to do some research about it and then the idea struck me that I could put my own spin on it and make a fiction series out of it. To put my idea into a novel I needed characters with archaeological knowledge and of course the main characters had to be young so that there was the opportunity for some romantic interaction between the characters. The supporting characters didn’t have to be young, they required skills and experience in various disciplines. When one studies the Great Pyramid of Egypt you will very soon find yourself knee-deep in trigonometry and mathematics and ancient languages. Hence the requirement to have some of the characters with skills in linguistics, mathematics and computers. And of course as the suspense was building, it became necessary to involve some bad characters and that’s how the Orion Society with its bizarre rituals came into existence. The discovery made by the heroes, Daniel Rossler and Dr. Sarah Clarke was of such momentous nature that it was impossible for the President of the United States and other senior government officials not to get involved. Daniel pumped his fist in the air. “I knew it! My god, we’re the first to ever see this message from at least three and a half thousand years ago! How cool is that?” He danced around the furniture in Mark’s office, swinging Sarah along with him in a waltz of some creativity. For her part, Sarah couldn’t stop smiling and now and then a giggle escaped her as Daniel narrowly missed some object that would have ended their dance in disaster. Finally, Daniel danced over to Mark, and let Sarah go only to throw his arms around the older man and lift him off his feet. Daniel’s answer was to pick him up again and give him a resounding kiss on the cheek. Just then, the pounding started again. Now the pair looked at each other in alarm. Sarah scrambled out of bed and grabbed her housecoat, rushing to the door while Daniel struggled to get his pants on. Sarah no sooner cracked the door open than two police officers shoved their way into the room, causing her to cry out in alarm. Daniel came racing down the hall, prepared to do battle. He glared at the officers. "Mr. Rossler, it, it, here…"
Daniel took the set, frowning with bewilderment at the agitated housekeeper. "Hello," he said. "Mr. Daniel Rossler?" queried the voice on the other end of the line. "This is the President of the United States of America. You seem to have dropped a bombshell, young man." Daniel almost dropped the phone. The President! Calling personally…and how had he obtained this number? "Yes, Mr. President, so it seems." "I trust that you and the lovely Ms. Clarke are loyal citizens of your country?" "May I ask why you chose to make this announcement from Israel?" Daniel's blood chilled a little when he realized that the President obviously knew their location. If the US knew, then so did other countries, maybe some that weren't so friendly. Not to mention the Orion Society. Carefully, he answered, "Mr. President, I'd like to respectfully refer you to the head of the CIA for the answer to that question." "Are you implying that the CIA has been involved in something that gave you reason to believe you weren't safe?" A heavy sigh was transmitted across the line. "Very well, I will speak to them. But I'd like to congratulate you on your discovery, and say how proud I am that Americans were the ones to break the code." "Sir, it took a great deal of effort, and not all of us are as American as you seem to think. Our data analyst is a naturalized citizen but was born in India. I want to emphasize that we feel the discovery belongs to the world, not just the US." "I'd very much like to have a conversation with you face-to-face, Mr. Rossler. May I send Air Force One to bring you home?" "Mr. President, thank you very much for the offer. But, for reasons I'll be happy to explain in person, we are not prepared to leave our present location. We're under the protection of the Israeli government, and that will stay the same until certain arrangements can be made. We're willing to meet with you, but only on our terms." President Harper's voice was a little colder, almost dangerous when he responded with deceptive mildness, "And what would those be, Mr. Rossler?" “Please go ahead. It seems to me there is a lot I don’t know that I should have known,” said the President, looking across the room at Bertrand who appeared very uncomfortable. “Mr. President some of our friends and colleagues were murdered during the course of our research, my grandparents were taken hostage and Dr. Clarke was kidnapped and almost killed. For most of this time, we were under the so-called protection of a CIA agent who we have now learned has been working for an international organization with malicious intent.